Home, they say, is where the heart is. But, to be young and to be uncertain, matters of love can be confusing - what if we don't know where our hearts, our affections, our hopes and dreams, actually lay? Things are never as simple as brief platitudes would suggest. 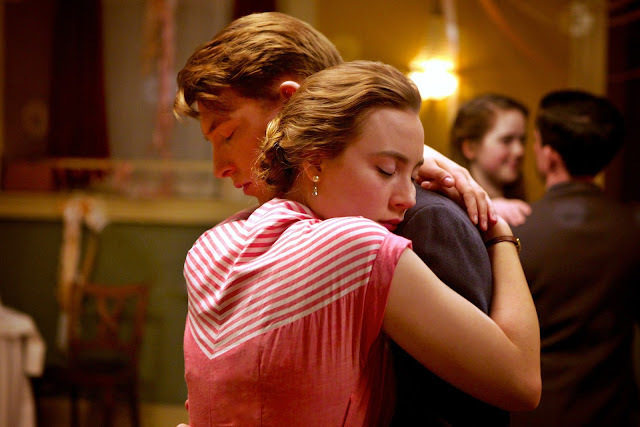 Brooklyn, John Crowley's adaptation of Colm Tóibín's novel, is a movie very much about belonging - physically and spiritually finding somewhere, and someone, we can call "home". Our hearts make home, he suggests, not vice versa. At the tale's dawn we meet Eilis Lacey; a young, Southern Irish lady from the 1950s who resides in a quaint Irish village which strangles her ambitions. Home, she suspects, may not actually be where he roots reside. What, she wonders, will she make of the world found in far-away lands and, equally, what will these lands make of her? An opportunity of employment opens up to Eilis but, alas, in America - her family don't provide heavy enough anchors to weigh the young lady down in Ireland and Eilis soon finds herself boarding a vessel to cross the ocean. 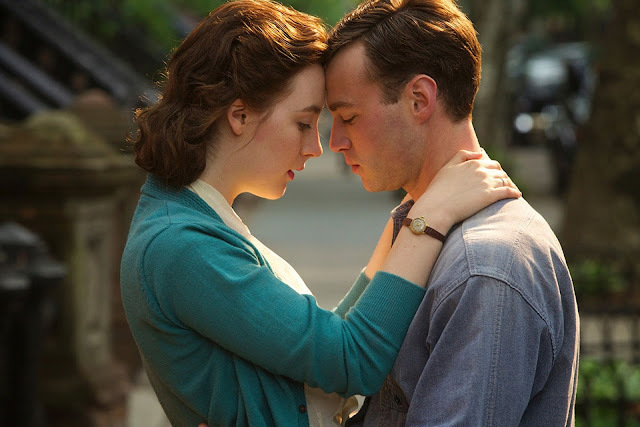 Yet, the sea sickness she experiences on the New York-bound boat is matched only by an equally violent and intense period of home-sickness when she arrives - it is only an encounter with Tony Fiorello (Emory Cohen) which provides Eilis with a cure. In Fiorello, Eilis meets the type of man she didn't believe existed in Ireland - macho and confident but, charmingly, winningly vulnerable, Tony offers her sensitivity and security, comfort and joy. Their romance is sweet; Tony, an Italian-American, walks a tight-rope of expressing confidently how he feels and, yet, allowing a clumsy self-awareness to govern his shyness. They're a great match for one another and, as they spend their time radiating in each other's company, we begin to suspect Eilis may have finally found home thousands of miles from where she was born. But, just like simple platitudes, things are never that simple. Eilis receives some unfortunate news requiring her to visit her Irish hometown once more. As she arrives, she realises not everything is as it once was - the village has changed and, more importantly, so has she. Brooklyn, a vast and impersonal borough, seems a world away from the lush greenery and serene open spaces of Enniscorthy. As Crowely's camera focuses on Lacey, standing on the beach at Ireland's periphery, we can feel pangs of a mild sea-breeze lapping up at us, a gentle sun dropping light, consoling rays onto our head as waves crash melodically around us. This, we feel, is a truly beautiful place. Eilis, a different young lady to the woman who once left here, finds herself caught between two very different worlds, two very strong senses of identity. How can she possibly choose where to surrender her heart to? Brooklyn is a lovely film. 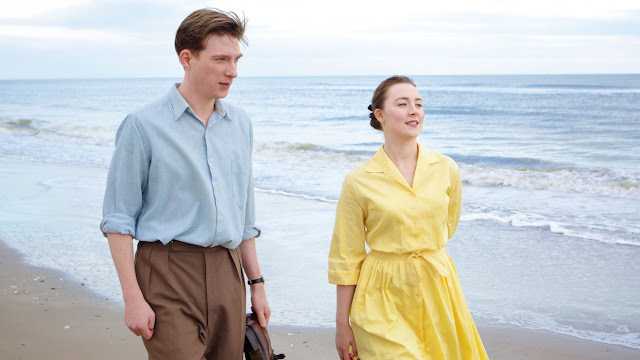 Wonderfully romantic, the graceful screenplay, perfectly paced by Nick Hornby, unfolds not with melodramatic excess but, rather, with tranquil moments of quiet contemplation. Crowley subtely frames the action with this understanding in mind; this is a movie not simply to be watched, but to be felt. 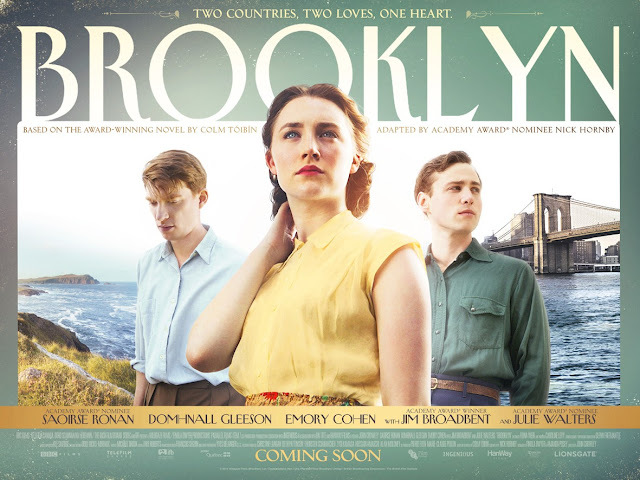 And, although much kudos has to be delivered to an impeccable supporting cast (including Julie Walters, Jim Broadbent, Domnhall Gleeson and, of course, Emory Cohen), Brooklyn is a film which quite simply belongs to Saoirse Ronan. A prodigious talent, Ronan manages to communicate, with elegant delicacy, the internal struggles and contradictions of a character who is both infinitely complex and complicated but whom, essentially, is ordinary like you or I. Although few of us are likely to have shared this exact story, each of us has experienced confusion and longing, insecurity and joy in our lives - each of our tales can be found in Ronan's eyes during this rather immaculate and empathetic performance. Were Oscars doled out on individual merit rather than as part of a larger political machine, Ronan would have already been handed her 2016 Academy Award for a peerless performance of gravitas and gusto. Brooklyn is a splenderous old-fashioned film and, come the Oscars, I know where my heart will lie.